Individual Story VI – I Am Here is a stone lithograph; Nam used only crayon to create this image and it is based on photographs he took himself. 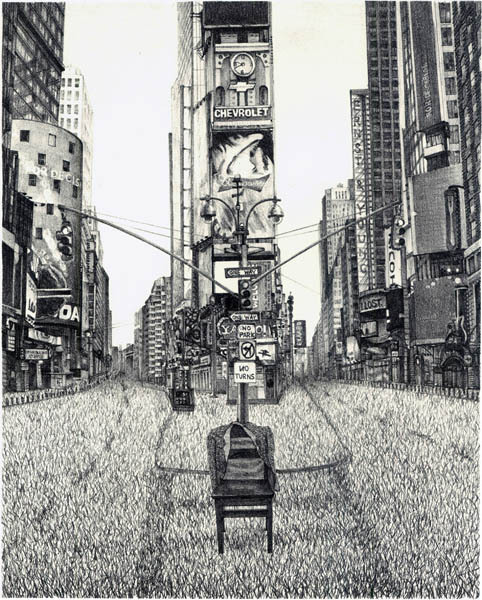 Nam depicts a grass-covered Time Square, transforming what was once the pulse of New York City into a ghost town; what may appear as the mecca of popular culture is silenced, reminding us that social class and access to information, finances, and the internet are defining culture in a global economy. American culture, often focused on assimilation, can leave the cultural outsider isolated, as if in a remote field where the masses of people become blades of grass, slowly growing over, engulfing and burying the vestiges of culture that remain in this modern metropolis. Individual Story I is an eight run, ten-color lithograph printed from stones and plates. Nam utilized a variety of drawing techniques and materials to create this image, namely crayons, maniere noire, blends, and transparent flats. Individual Story I is part of a series of images that portray the specific challenges Nam has faced as an Asian artist in middle America. Nam struggles with the pressures of assimilation and often sees his own struggles mirrored in his daughter’s daily experiences. Individual Story I speaks of reluctant ears, silent screams, and distant memories interwoven with the American dream. Individual Story II is a ten run, eleven color lithograph printed from stone and plates. Nam drew with litho crayons, a rapidiograph pen, and transparent flats to create the image. The central scene is a blending of the basketball hoop in his back yard with the schoolyard of PS 58 in Brooklyn, NY. The empty chairs, lined up along the foul line and awaiting the “free throw”, place adult pressures on children where they germinate. Individual Story II takes a critical look at American culture through the eyes of a Korean artist and father as he watches the re-shaping of his daughter’s native cultural identity as they struggle to succeed. Chunwoo Nam was born in Seoul, Korea and holds degrees from the University of HongIk, Korea, the Tamarind Institute for Lithography, NM and the University of Buffalo, NY. His work is exhibited internationally and he has taught at the Herron School of Art in Indiana. His work can be found in the following collections: Tokyo Metropolitan Art Museum, Japan, National Taiwan Museum of Fine Arts, Taiwan, R.O.C, Kennedy Museum of Art, OH, the Novosibirsk State Art Museum, Russia, and more.